Merit pay tied to student test scores seems all the rage in some educational circles, but many teachers think it's an idea whose time hasn't come. It's a concept that is gaining ground in state capitals and in Washington, nevertheless. Members of Congress, for instance, are considering adding funding bonuses for teachers who raise student achievement as part of the No Child Left Behind Act, which is up for review this year. Proponents say such a system would reward effective teachers and attract strong new recruits to the profession. But teachers attending the annual convention of the National Education Association seem dubious — even if it could put more money in their pockets. Deborah Torres-Gore, who teaches second- and third-graders in Fontana, Calif., said other factors must be considered when judging the effectiveness of teachers. "When I look into the eyes of a student who I have taught in the past — or I stand at the door in the morning and my students say Mrs. Gore, 'I love you,' or Mrs. Gore, 'You're such a good teacher' — am I effective or not? I think I'm effective," she said. The teachers here are members of the NEA, the nation's largest teachers union. They say they worry that educators in struggling schools, where students might be poor or speak another language at home, would have trouble getting their student scores up enough to earn the "effective" label. For their part, many educational policy-makers say that a merit pay system could take such circumstances into account. But teachers seem skeptical. "Can you account for the child's emotions? Can you account for whether their parents are getting them to school on time?" asked Sharon Vandagriff, a third-grade teacher near Chattanooga, Tenn.
Tennessee is far ahead of other states in monitoring student progress and using that information to see which teachers are producing the biggest gains. The information is used for professional development and planning purposes, but not for merit pay. It is expected that the No Child Left Behind law will be changed to require school systems to monitor the performance of individual students over time. Right now, the law requires students in certain grades to be tested and then compares their scores to students in that grade the year before. Teachers say they would prefer a system that tracks individual students. However, once you measure that, you can't ignore which teachers are moving their students along well, says Ross Wiener, who oversees policy issues at Education Trust, a Washington-based group that advocates for poor and minority children. "There are huge differences in the effectiveness of individual teachers," Wiener said. "You have to be able to look at growth measures at the classroom level, so principals and other administrators understand which classrooms are accelerating student learning and which ones aren't." Sandi Jacobs, vice president of the National Council on Teacher Quality, another nonpartisan Washington group, said that measuring teacher effectiveness, and paying educators accordingly, would bring public education in line with other professions. "In most professions people earn salaries based on merit, not based on formula schedules," she said, referring to the current way teachers are paid. But teachers say their profession is unlike others. "They're looking at this as if we're manufacturing automobiles," said Sandy Hughes, who teaches high school English, French and Latin, also near Chattanooga. "With children, you're working with unique individuals, all of whom have unique qualities. Our variables are so extensive." There is one group of teachers at the convention who not only support merit pay, but helped put it in place. They teach in the Denver school system, which just fully implemented a districtwide merit pay system. It took several years to design and has the support of the local NEA chapter. Kim Ursetta is president of that local union, and she said the system works in Denver because it is based on student test scores and several other factors, such as whether a teacher signs up for professional development or has a good annual review. She said in addition to relying on the reading and math scores used under No Child Left Behind, the merit pay system also measures whether students met other goals set out by teachers and administrators. She said that has led to greater collaboration and more of a focus on raising student achievement. "We never sat down before as teachers to talk about where are students were," Ursetta said. "It's forcing continual conversation about student learning." All Denver teachers are eligible for merit pay, not just those who teach reading and math, the subjects tested under the federal education law, Ursetta said. If teachers work in hard-to-staff schools, they also can get paid more. 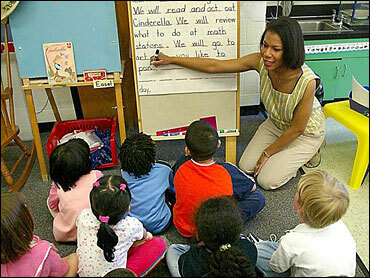 Teachers are getting on average about $5,000 more a year under the new system, Ursetta said. Denver residents agreed to pay for it through a tax increase. Ursetta said she's received calls from policy-makers and educators nationwide — and even abroad — who want to learn about the Denver system. But her advice is not to copy it. "This was developed by and for Denver," she said. "These systems need to be based on the kids you have in your district."